Our vision as Eco-Artists is to provide a unique Fine-Art-Quality product, which is aesthetic, functional and ecologically sound. 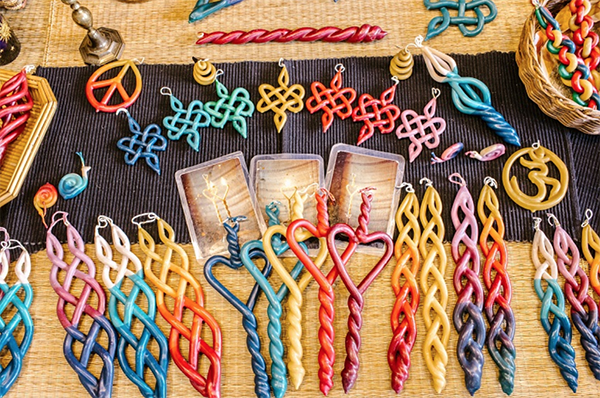 Our wide array of hand-crafted, original designs interweave worldwide cultural influences and symbols, with our own unique style of dipping ~ twisting ~ braiding ~ weaving, creating elegant, intricate and “never-before-seen” candle designs in 100% Beeswax. We are happy to share these Light-Giving-Sculptures with you and are honored to have our Fine~Art~Light~Works included in your daily, seasonal and special celebrations! We create and offer a wide array of pure beeswax candle styles & designs to choose from, including 100% Beeswax tea-lights, long burning votives & tapers, pure essential oil infused tea-lights & votives, many unique styles of multiple-flamed braided, twisted & woven designs, ceremonial & celebration candles, Havdalah, birthday & unity candles, fun whimsical designs, custom designs and much much more!